Call us for the January 1, 2018 - Chick-Fil A Peach Bowl in the New Mercedes Benz Stadium, Atlanta Georgia. 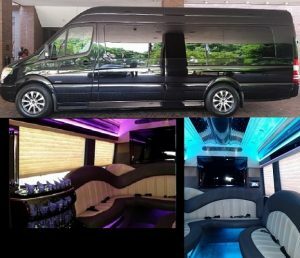 Ask about the Executive Luxury Mercedes Benz Sprinter Limo and Party Bus for a group size up to 14 People. Ride in style into you game by calling (404) 429-5750. For more choices of sprinters visit our sprinters Page. There are currently no comments for Chick-Fil-A Peach Bowl Limos.